Crickets are a complete source of protein and nutrition. Eating insects isn’t a new idea, but we have made it a better one with our full range of products and flavors. Eating insects, or entomophagy, is more of a rediscovery of ancient and current practices, but with a modern focus to commercialize this amazing superfood protein source. The resurgence of edible insects today is inspired by the sustainability of their production as a food source and new food applications. 80% of the world currently eats insects as part of their normal diet, but eating insects is still a new concept for many. 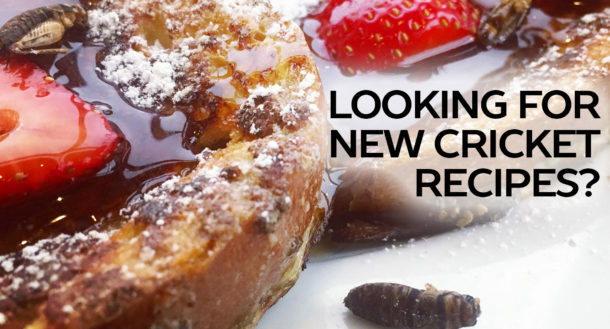 Crickets are a high-protein low-carb option that might be from the original Paleo diet. Crickets are 65% protein by weight, and have a natural slightly nutty and earthy taste. In addition to chitosan and protein, crickets naturally contain all the essential amino acids, Omega-3s, Omega-6s, B12 and more. 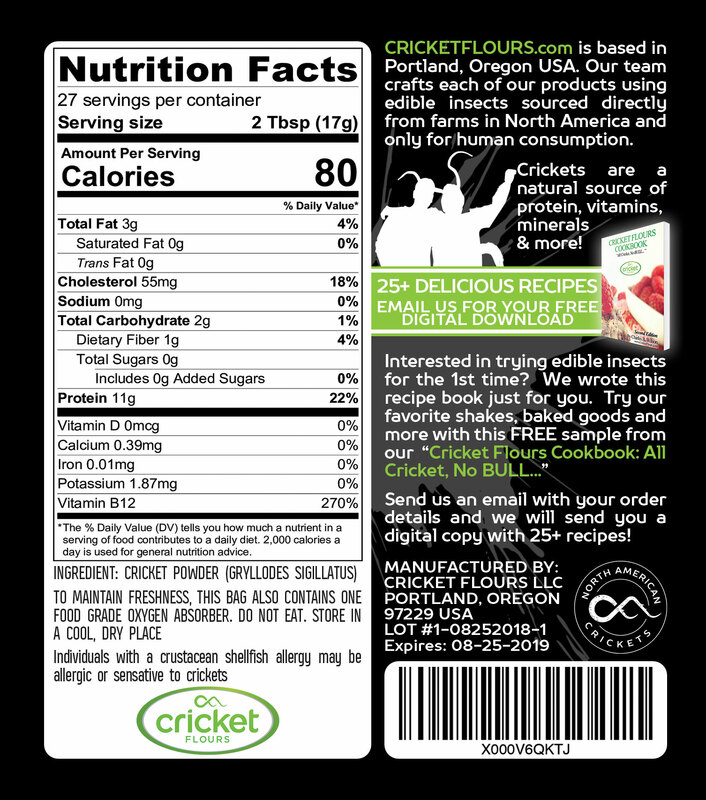 This nutritional label is from one of our Cricket Flours: 100% Pure Cricket Powder products. While our cricket nutritional value and cricket flour nutrition is set to 2 TBSP servings, you can see that it provides a great range of nutritional benefits that can be added to your normal baking recipes or in a cricket flour protein shake or cricket flour smoothie as well. Some people use cricket protein to get more protein or iron in their recipes for their children to get more in their diet, or to use in baking flours to reduce carbs and spikes in their glycemic index levels. However, in addition to the protein, minerals and nutrients mentioned above, cricket flour is a complete source of protein contains essential amino acids such as leucine, lysine, methionine, phenylalanine, threonine, and valine. 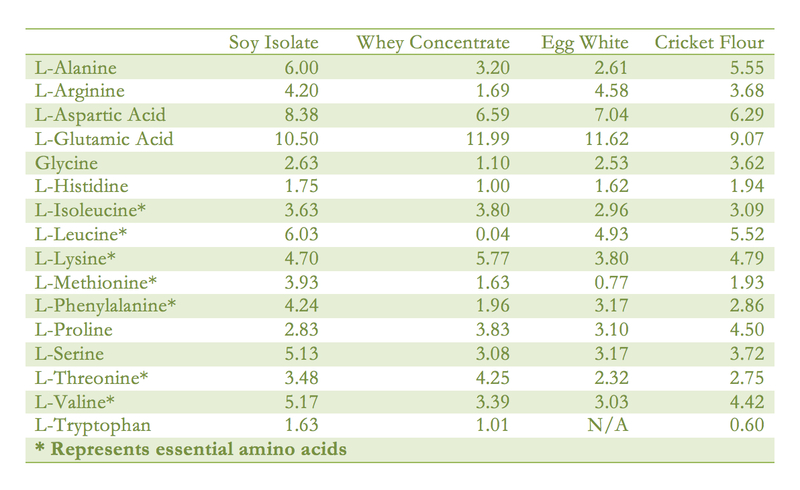 We have gathered some amazing research details regarding the cricket protein quality and cricket nutritional values and set them out in the table below. Understanding the cricket nutritional value is a key part in getting people to understand the benefits of choosing cricket proteins. Also, weightlifters often ask whether cricket protein powder contains BCAAs or branched-chain amino acids that are a main selling component of popular protein powder products. The research shows that cricket flour has all three BCAAs, and ranks 2nd overall for leucine, 3rd for isoleucine, and 2nd for valine. *To read the original research studies and learn more about cricket proteins and the cricket nutritional value found in cricket flour, click here and here.